HEALTHCARE LINT FREE WIPES • "POLYSOFT WIPES"
When it comes to taking care of the vulnerable population, you can’t leave any stone unturned. Healthcare professionals caring for the aged and children always need to ensure a hygienic environment is maintained to reduce the risk of unnecessary exposure to any germs or pollutants which can be life threatening. They have to ensure the safest procedures and adopt best practices of the industry. When patients, the aged or children are the priority, POLYSOFT lint-free healthcare wipes become a necessity! From wiping noses to sensitive skins, the soft fabric is gentle on skin and doesn’t feel uncomfortable. Washed multiple times before being vacuum packed and double bagged in a cleanroom, POLYSOFT sterile and hygienic soft patient wipes are ideal for healthcare wiping tasks. These soft healthcare cleaning cloths are laundered 4-5 times in de-ionized water to purify them. The final product is then assembled in a Class 100 (ISO Class 5) cleanroom so that POLYSOFT wipes can be used in hygiene sensitive environments such as hospitals, aged care facilities and childcare organisations, such as schools and day care centres. One of the best characteristics of these soft, sterile hospital wipes is that they are lint-free, meaning that no loose fiber or fluff is left behind after wiping sensitive surfaces. This is a result of the intentional tightly woven double knit manufacture of these cloths, to minimise any loose fibre or particle release. Available in convenient portable packs of 150 wipes, these patient wipes are handy to have aroud to to absorb any discharge or liquid effectively. Apart from patient care, the POLYSOFT lint-free healthcare wipes can also be used to clean sensitive surfaces, such as medical equipment, monitors, touchscreens or control panels. Their lint free nature and non-abrasive texture makes ideal in the cleaning of glass and other sensitive surfaces. So next time you need a soft, gentle wipe for skin care, or a lint-free wiper to clean a delicate surface, grab a pack of POLYSOFT Healthcare Wipes....the safe and sensitive wipes for the healthcare sector! 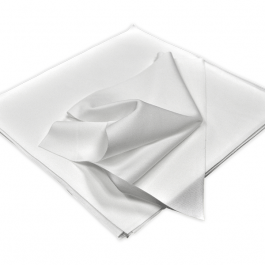 Other related products from TIDDOX 's range of healthcare cleaning cloths include the DISPOSABLE WHITE WIPES-ON-A-ROLL , the OMNIWIPES, (another soft skincare cloth used in aged care and hospitals) and the LOW LINT INDUSTRO WIPES.